She also took her "emotional-support turkey" to Katz's Deli, and an alpaca to the drugstore. There’s a lot of confusion and misunderstanding about what emotional-support animals can legally do, and where they can legally go. Patricia Marx, a writer for The New Yorker, decided to go undercover as a person with an anxiety disorder (“not a stretch,” she writes) and run around NYC with five animals for which she obtained emotional-support animal (E.S.A.) credentials. 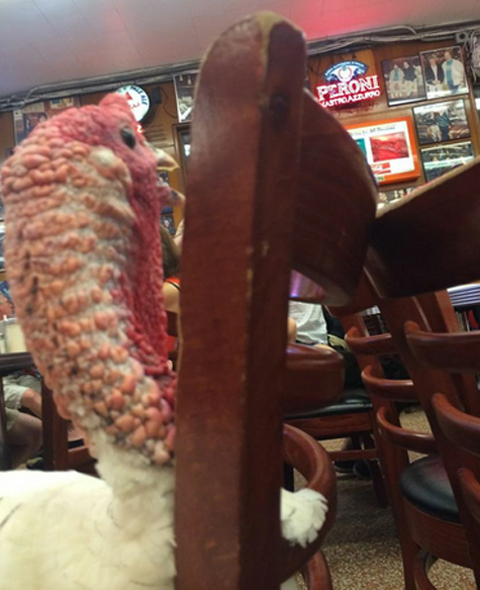 Marx brought a turkey to Katz’s Deli, where the animal was welcomed by the guy at the front desk after Marx showed him her therapist’s letter. Then, Marx took an alpaca—weighing 105 pounds and standing four-and-a-half feet tall—to the drugstore. This was after taking the animal on a train from Hudson to Niagara Falls. By far the best “I can do whatever I want with my emotional-support animal” stunt Marx pulled was bringing a one-year-old pig named Daphne to The Four Seasons in Boston for tea. This was after Marx brought Daphne on an airplane from Newark, NJ to Boston. But Alavian hadn’t done his research. “Even with a card, it is against the law and a violation of the city’s health code to take an animal into a restaurant,” writes Marx. Either way, we really wish we could take an adorable animal to go have tea at a luxury hotel. We’d also like to take a pig to The Spotted Pig, an owl to The Little Owl, and a fox to Lower East Side Argentine restaurant A Casa Fox. Maybe we’ll go home and file our pet iguana for E.S.A. credentials after work today.